I have been following in my father’s ski tracks my entire life. Not much has changed. My father put me on skies when I was three years-old; then I spent winter mornings in ski school until I was able to ski blue runs fluently. So many ski trips are burned into my memory. Packing up before dawn and heading out toward the mountains. A pack of licorice and the ski cassette tape of classic rock, so used that it began to unravel. Aching ankles, sore legs, and full body chills into the nap on the way home. I haven’t skied in YEARS. 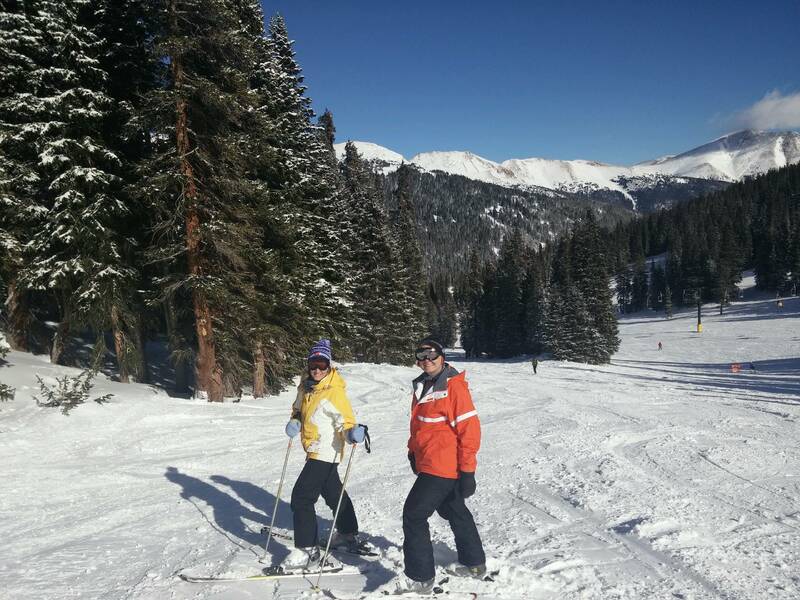 The last time I attempted to ski, I never even saw the slopes. I was pregnant with my (now two year-old) son and had debilitating morning sickness. I puked the entire drive up to the resort, on the side of the road in heavy Denver traffic. Then I spent the day vomiting in the lodge. The entire day. I passed out on the table then stumbled into the bathroom to lose the sips of water I had taken. The sickness, puking, and cramps were so serious that I was honestly concerned I was going to lose my baby. 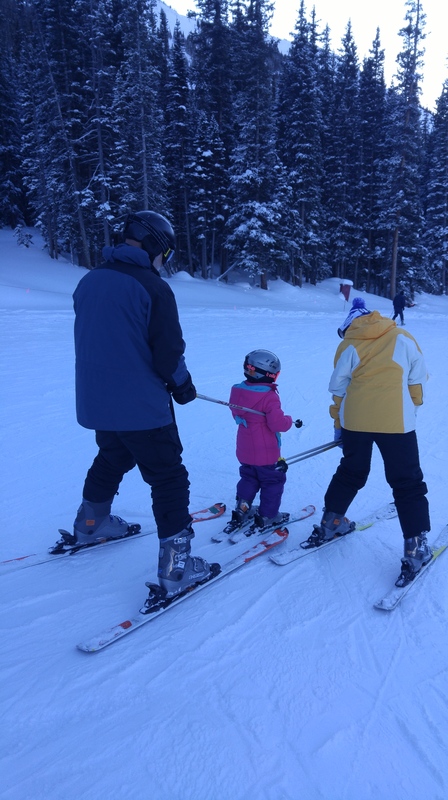 This time, I brought my five year-old daughter for her first time skiing, and, just like my father before me, I deposited her in ski school in the morning. Establishing and continuing family traditions. The day did not start out well for me. 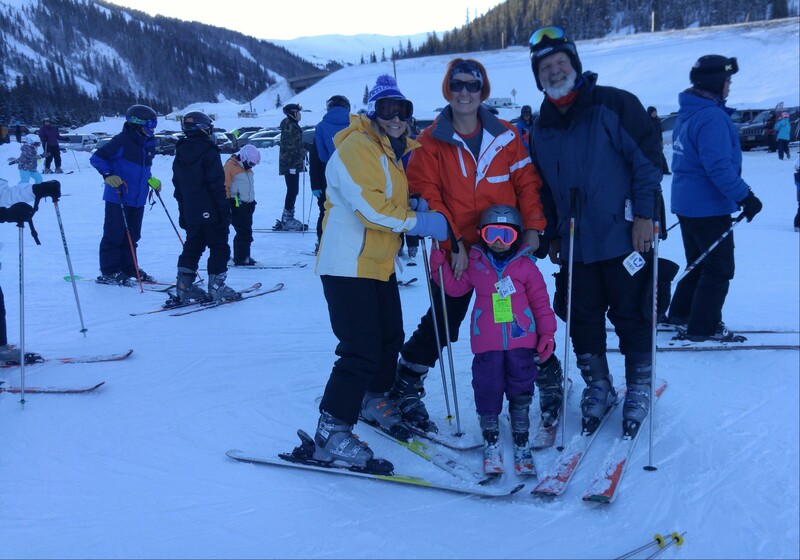 After my daughter was all squared away and I launched off with my father and sister, I found my ski boots very uncomfortable. I had them before my two children and apparently my feet changed substantially in that time. When I wrestled all the bindings closed, they pressed on my ankle in some way that was just excruciating. My toes went numb; it felt like the side of my foot was tearing. I tried to power through. I told myself to breathe through it. I told myself it would loosen with time. I popped a couple bindings. Yet, on the lift, I had to counsel myself out of how much it hurt. On the first run down, I found skiing to be very difficult, harder than I really remembered. I wobbled. I was slow and cautious. It was just unpleasant. I did not feel like myself at all. I thought perhaps it had been too long and I had forgotten my technique over the years. By the bottom, I decided to just go rent new boots. New boots were like a whole new world. Without the pain, everything became easy again; muscle memory returned. My mind even cleared and returned. After months of dealing with the constant hamstring pain, I simply could not process additional pain signals; I could not deal. Yet without the pain, skiing was awesome again! 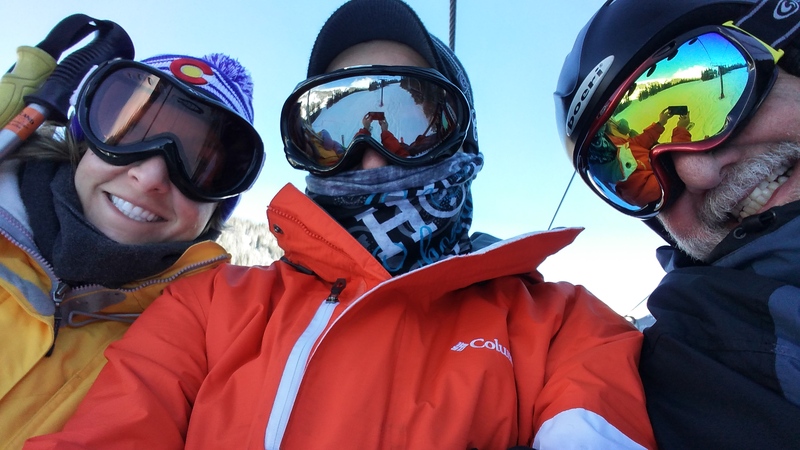 Even with my gimpy hamstring, I blazed down after my family, carving around moguls and bouncing over powder. I forgot how good it felt to whip down a mountain, to hear the snow compacting under me, to feel the flakes in the winter air on my face. I felt that familiar euphoria and remember why I loved it so much. We laid down some good runs in the morning. 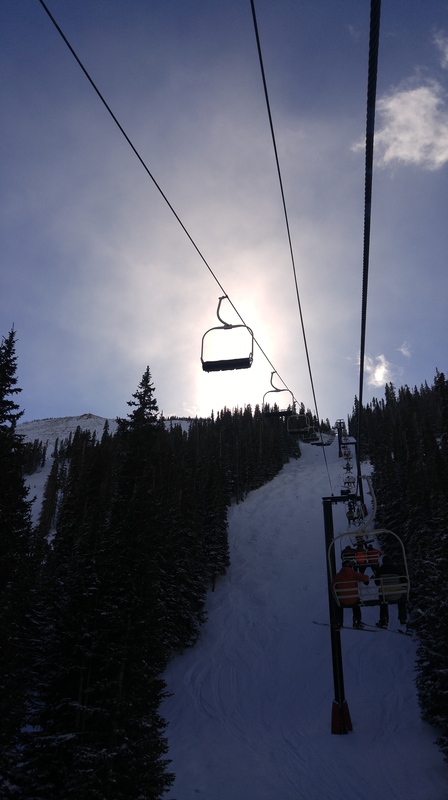 The Loveland win bit hard on the high lifts, but otherwise, we rode the mountain under clear skies and high sun. The hamstring only balked when carving through ice or deep powder and only when turning left when I really had to lean down into that left leg. We took lunch and then back to the slopes. Somewhere in the afternoon, we accidentally ended up on a black run. Black runs are not out of any of our ability; however, with my father’s spinal stenosis and disk cyst and my 5 months injured hamstring, it was not in our plan for the day (I wonder where I get my tendency to ignore pain and do whatever I want in spite of my body). We all survived, but the run pretty much winded down our day. We migrated from the Basin back to the Valley to have some drinks waiting for my daughter to be done with ski school. I was curious to see how she did, but she loved it and did fantastic. We took her on one final run to end the day. She did so well. I was impressed at her ability after one short day and amazingly proud of her. 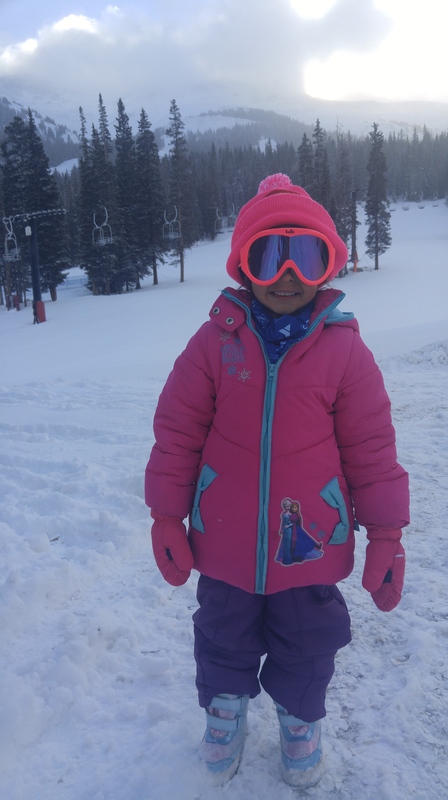 For a child who often whines and attempts to get people to do things for her, she was calm and determined and brave, even after 5 hours of ski school. She wanted to keep going; she outlasted the adults. In the end, it was a great day. Plenty of exercise that reminded me of why I love the sport and another opportunity to introduce my daughter to an activity I enjoy. It will definitely not be years before I return to the slopes.